The KFU itinerary was quite packed these days. Kazan University and Ritek JSC plan to continue their cooperation. Some interim results of drill sample analysis from Middle Nazym oil field in Western Siberia were discussed during the meeting. Ritek is also interested in KFU’s research in interbedding combustion and thermal gas treatment. The University can provide a unique combination of research methods, such as SARA-analysis, chromatography, thermal analysis and calorimetry, NMR spectroscopy, isotope analysis, magnetic properties measurement, etc. Such a comprehensive set has not yet become available to any other Russian universities. Rector Ilshat Gafurov visiting the opening of three new production facilities at Himgrad complex in Kazan. Those are Air Liquide gas production, new regional center for bioengineering, and Nanopharma Development lab and production office. Vice-Minister of Industry and Trade of Russia Gulnaz Kadyrova visited the University on September 8th. 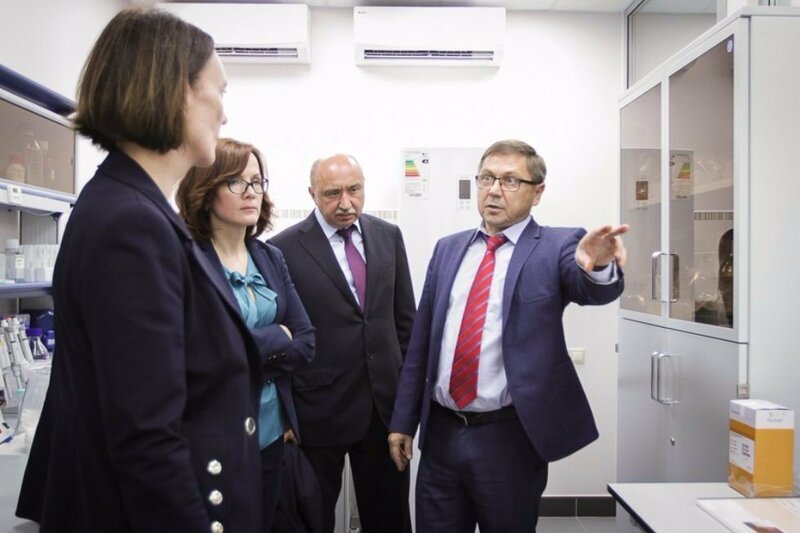 She toured the pharmaceutical research facilities and discussed further projects within the Pharma 2020 framework. Time has come for the Rector’s traditional meetings with institutes. The Institute of Fundamental Medicine and Biology and the Faculty of Law were the first in line these past Thursday and Friday. Rector Gafurov and the institutes’ employees exchanged opinions and clarified some issues. Naturally, the academics were most interested in the new salary and bonus system and the recent radical staff changes at the federal Ministry of Education and Science of Russia.